Last year, three Google Artificial Intelligence (AI) bots learned to encrypt their communications… in their OWN language… a language that they kept secret from any humans who might be listening in. I don’t know if you’ve seen the Terminator films, but this is how it all begins, isn’t it? …and ends with nuclear war and a full-blown battle between humans and machines. No wonder global authorities are getting uncomfortable with the monopolistic entities Google, Amazon and Facebook. These are huge companies with vast userbases larger than most continents. They have algorithms and systems that feed off our behaviour, growing more powerful and all-knowing every day. The more we type our thoughts, desires and details into Google, the more it learns, the more it knows about us. And the system is becoming intelligent! Scary stuff or exciting stuff, depending on your point of view. Whatever your thoughts on the future of AI this is good news for small businesses and online entrepreneuers in the here and now. Google now has a LOT of information about your customers: what they’re thinking, what they’re looking for, what they’re experiencing when they come to your website, whether on mobile or desktop. And they’re willing to share some of this with you. The common wisdom is that Google doesn’t give away any of its secrets, making it hard for marketers to hack the system or swing results in their favour. And yes, when it comes to their search algorithm, they’re very tight lipped. Think With Google launched in 2013 as hub for advice, data, tools and trend analysis to help people like you and I get better results. By that I mean, more relevant website content for higher rankings, faster websites for more customer retention, more mobile customers and better targeting of your customers based on location, peak usage and search habits. They’ve got a lots of deadly-accurate, constantly updated data you can use on here, and for free. It’s straight forward to use. Simply go to the platform and select the UK in the top left corner, which will make the results are more relevant. On the homepage you’ll see updated articles that can help with your marketing. For instance, there’s one called, ‘Which Brands Have the Most User-Friendly Mobile Sites in the UK?’ Another one called ‘How to Capture Attention in Six seconds’. Google’s stats show that the average time it takes to load a website on a mobile device is 15 seconds. That’s a quicker average than the previous year, but they point out that this is still too slow. A massive 53% of mobile users will click away from a page that takes longer than three seconds to load. So if your mobile site is too slow to load, you’re going to lose a lot of potential enquirers and customers. 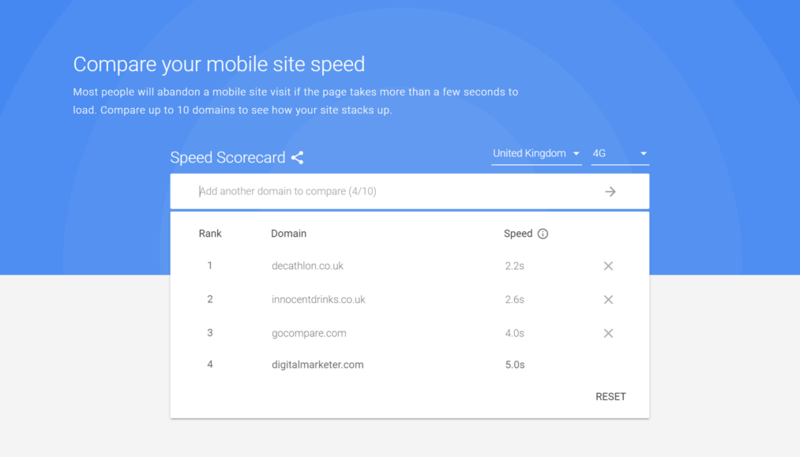 Google’s mobile speed scorecard helps you compare the speed of your mobile website with others – here I’ve tapped in a few examples. The problem is, I tried a lot of sites on this and they weren’t “on the database”. This is because they take the data from a set of popular URLs that are known by Google’s web crawlers. So this was mainly useful for spying on the speed times of some of the more mainstream websites. However, this next tool was better, and should work on your website…. Test My Site analyses the speed of your mobile site, with a free report that will target the problems that are slowing it down. This worked for all the websites I tried, so yours will be on there, most likely. Simply enter your website URL or that of a competitor, and you’ll get a loading time with an estimate of how many visitors you’ll lose because of it. If you click on the link below the results, they’ll email you a free report about how to improve those stats. The email will lists a load of technical issues to solve, with click through links for you to read about them. These might sound techy and terrifying, but their reports will help clarify. This is also information you could give to a website developer, IT expert our outsourced tech freelancer, who can then fix it all for you. If you want to know what your customers are currently most interested in, and what they’re looking for on Google, Google Trends offers a good snapshot. Type in a topic, niche or theme related to your business, or some content you are researching. 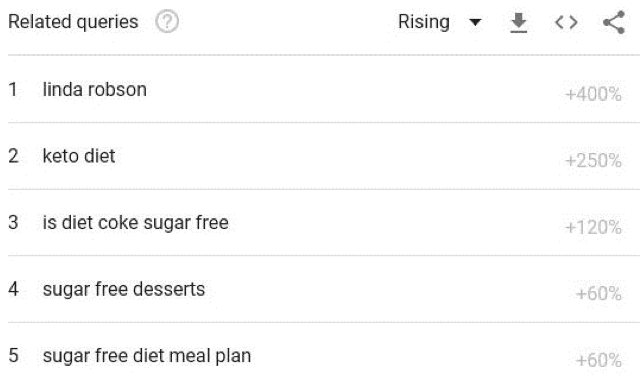 It will show you a graph of the popularity of that search term over time, like this, example, where I’ve typed in “sugar free diet”. The above chart shows a spike in searches for ‘Sugar Free Diet” after Christmas and New Year. Clearly a good time to advertise or create content around that subject. Linda Robson is a surprise top result here, but that’s because the actress and Loose Women guest was in the media for the weight loss she’s experienced after her sugar-free diet. Any of these topics would make ideal blog posts, reports, videos or Facebook updates, as they’re relevant and trending, which means you’ll get better Google rankings, as well as more interest on social media. For more of Google’s own stats and analysis, check out Think With Google. As you’ll see, Google are quite open about trends, stats and tech that could help boost our traffic and conversions. Sure, they may well be harbingers of the robot apocalypse, but for now they could help you grow your business. This is very useful information. The web is getting so big, getting going is harder than ever unless we know some of the shortcuts.